The Energy Action Team is a group of county department heads and staff from Finance, Highway, Land and Water Management, Maintenance, Planning and Parks, Transit, and UW-Extension, representatives from We Energies and Focus on Energy, chair of the Natural Resources Committee of the Ozaukee County Board of Supervisors, and the County Administrator. The team was created by the Ozaukee County Board in June of 2014. Individuals who have contributed to the team’s work include: Gerard Behlen, Jon Edgren, Monte Hale, Jennifer Hesson, Joe Hicks, Andy Holschbach, Andrew Lamb, Jeff Mackey, Tom Meaux, Kate Pawasarat, Jennifer Rothstein, Chris Seitz, Andrew Struck, and Jason Wittek. 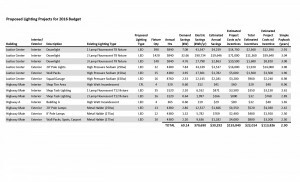 November 2013: The Committee reviewed a report summarizing current and recent county government projects and practices relating to energy efficiency, water conservation, waste management, and sustainable design. 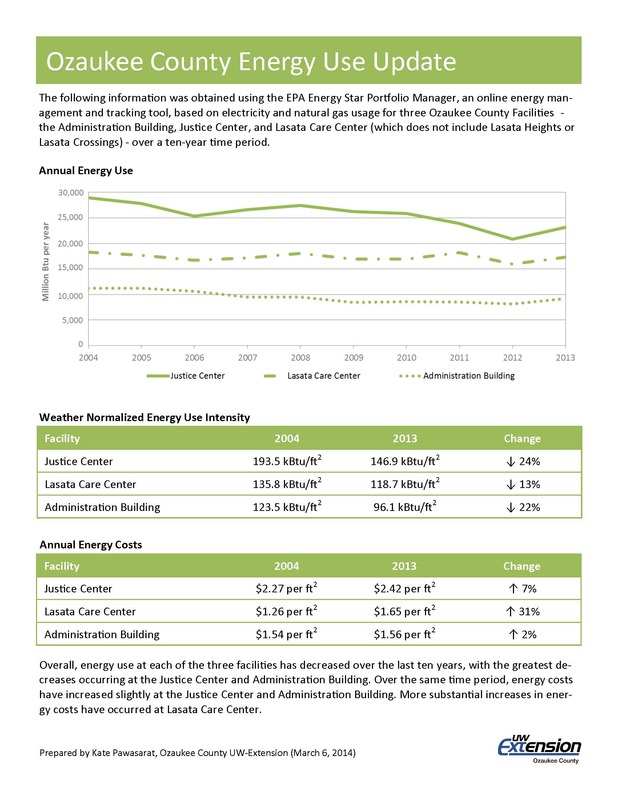 March 2014: The Committee reviewed energy use at three of the largest Ozaukee County facilities – the Administration Center, Justice Center, and Lasata Care Center – over a ten-year time period from 2004 to 2013. Overall, energy use at each of the three facilities has decreased over the last ten years, with a 24% decrease in weather normalized energy use intensity at the Justice Center and a 22% decrease at the Administration Center. 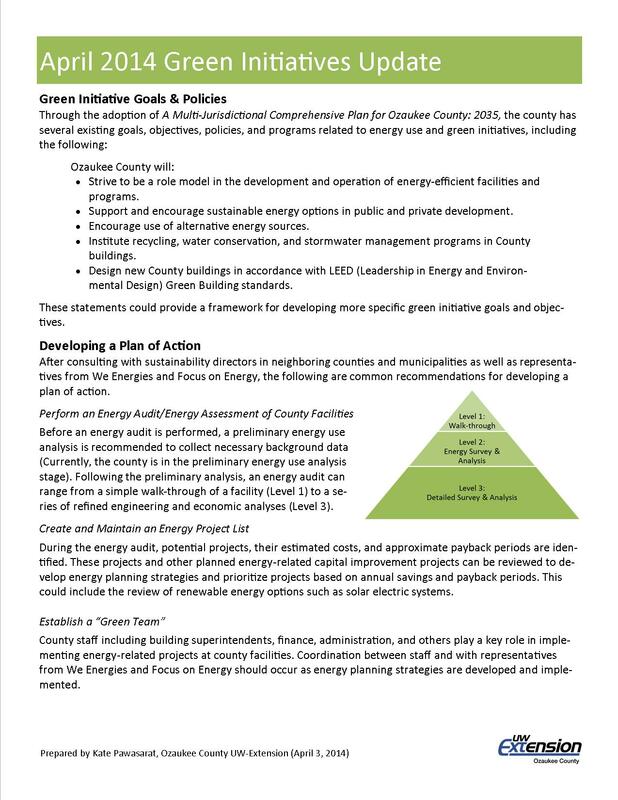 April 2014: The Committee reviewed existing goals, objectives, policies, and programs related to energy use and green initiatives in the county’s Comprehensive Plan and discussed options for developing a plan of action for moving forward. July 2014: The Energy Action Team was formed and met for the first time. 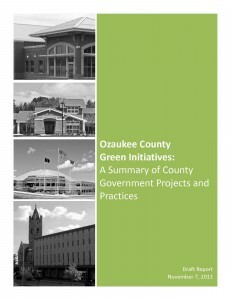 Agendas and minutes from Energy Action Team meetings are available on the Ozaukee County website. 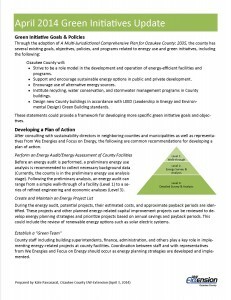 November 2014: The Energy Action Team developed a set of energy-related goals for county government operations and facilities and outlined a process for action planning and implementation. 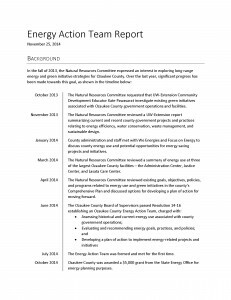 December 2014: A summary of the Energy Action Team’s work was provided to the Natural Resources Committee. 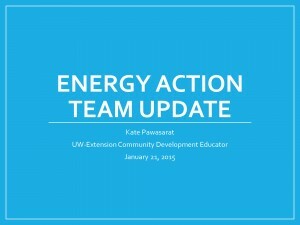 January 2015: A summary of the Energy Action Team’s work was provided to the County Board. 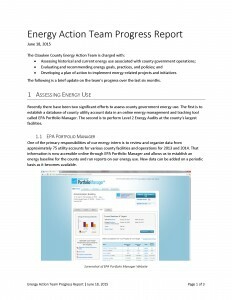 Spring 2015: County energy data is organized and managed through EPA Energy Star Portfolio Manager. We Energies performs energy audits of some of the county’s largest facilities including the Justice Center, Lasata Care Center, and Highway Department buildings. 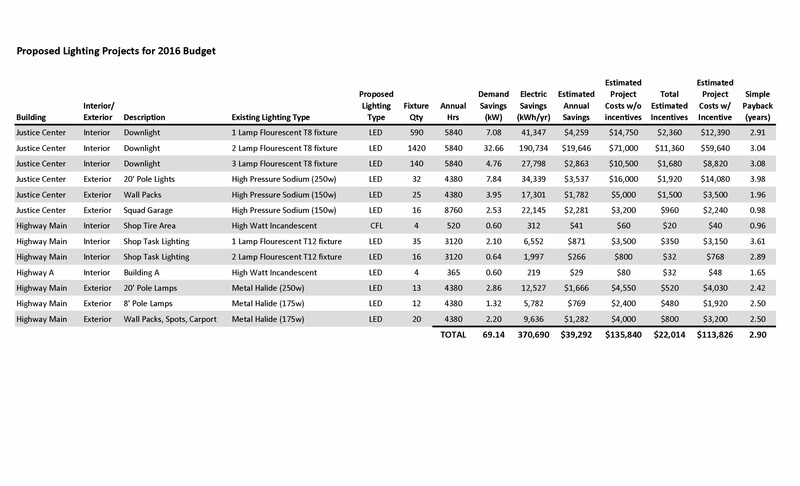 November 2015: The Ozaukee County Board of Supervisors approved approximately $114,500 in the County’s 2016 Budget for energy efficiency lighting improvements at the Justice Center and Highway Department facilities. 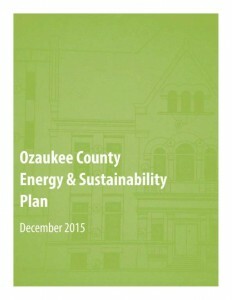 Fall/Winter 2015: The Energy Action Team completed the Ozaukee County Energy and Sustainability Plan, which outlines a collection of strategies for county government operations and facilities in an effort to promote economic and environmental stewardship and to improve the quality of life for Ozaukee County’s current and future residents.